Process Oriented Guided Inquiry Learning (POGIL) is a method of instruction where each student takes an active role in the classroom. The activities contained in this collection are specially designed guided inquiry activities intended for the student to complete during class while working with a small group of peers. Each activity introduces essential organic chemistry content in a model that contains examples, experimental data, reactions, or other important information. Each activity is followed by a series of questions designed to lead the student through the thought processes that will result in the comprehension of critical organic chemistry concepts. At the end of each activity are additional questions, which will generally be completed outside of class time and are more similar to questions that might appear on exams. Before each class, students should ensure that they are familiar with the prior knowledge that is listed at the beginning of every activity. These POGIL Organic Chemistry activities were written to cover most of the important concepts for a two semester organic chemistry sequence. The activities are grouped into organic 1 and organic 2, although that might vary from class to class depending on what concepts are covered in each semester. 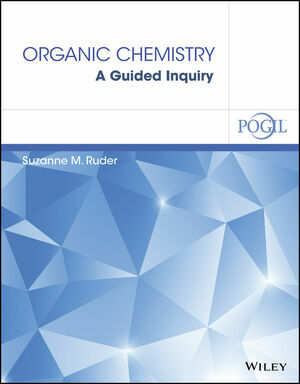 Suzanne M. Ruder and The POGIL Project are the authors of Organic Chemistry: A Guided Inquiry, published by Wiley. 16A Alcohols: Versatile Reagents: Part A. Alcohols as acids, bases, nucleophiles and electrophiles. 16B Alcohols: Versatile Reagents: Part B. Reactions of alcohols as Nucleophiles and Electrophiles.